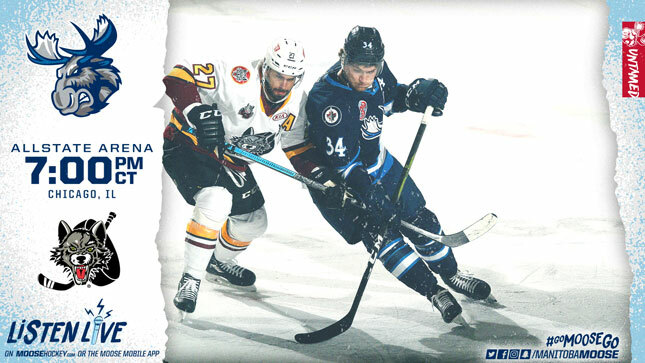 The Manitoba Moose (20-19-3-2) roll into the den of the Chicago Wolves (24-15-5-1) tonight, for their fourth meeting of the season. With puck drop at 7 p.m. CT, the game will be available on moosehockey.com/listenlive/, the Moose App, and streaming live on AHLTV. Manitoba enters today’s contest with a 3-2 overtime win still fresh on their minds from last night in Milwaukee. Chicago also played on Friday night, losing 5-2 to the IceHogs in Rockford. The last time the Moose and Wolves met was Nov. 18 at Allstate Arena in Chicago. The Wolves picked up a 4-2 victory despite Moose netminder Ken Appleby stopping 39 of 42 shots, and JC Lipon scoring twice. Tonight’s matchup is a meeting of one of the hottest teams in the AHL, and a roster fighting to hold onto their playoff spot. Manitoba being the former, with a record of 7-2-1-2 in their last 12 games. Chicago, the latter, hold a record of 4-6-2-0 in their last 12 outings. Players to watch for tonight are familiar for Moose fans. Seth Griffith pushed his point streak to 10 games (1G, 13A), while Logan Shaw potted his 19th goal of the season, and sixth in his last eight games. The two 26 year olds are tied for the team lead with 31 points on the year. Griffith could be an added factor as he leads the Moose-Wolves series this season thanks to a five-point (2G, 3A) two-game set at Bell MTS Place earlier this season (Nov. 2/3). One thing Comrie hasn’t done this season, is start against the Wolves. In 2017-18, however, the former Winnipeg Jets second round pick (59th overall, 2013) won five of his six starts against Chicago. Comrie won all three of his starts in Allstate Arena last season stopping, 81 of 84 of the Wolves’s shots. The Moose have one more stop (Feb. 6, in Grand Rapids) before they return home for a six-game home stand. That begins on Feb. 9 against the Texas Stars on Multicultural Night. Head to moosehockey.com/tickets/ for tickets to all upcoming home games.